* Anemometer, Temperature meter, two in one, professional. * Anemometer unit : m/S, Km/h, FPM, mph, Knot. * Temperature measurement with ℃, ℉ unit. 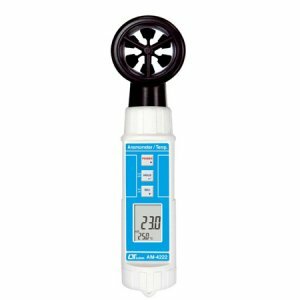 * Vane anemometer, available for air velocity measurement, high reliability. * Two display show air velocity and temperature value at the same time. * Microprocessor circuit ensures high accuracy and provides special functions and features. * Records Maximum and Minimum readings with recall. * Auto power off saves battery life. * Operates from DC 1.5V ( UM4/AAA ) x 4 PCs batteries. * Low-friction ball vane wheels is accurate in both high and low velocities. * Durable, long-lasting components, enclosed in strong, compact ABS-plastic housing.